Matt Lepor is currently attending Firefighter 1 class at the Cape May County Fire Training Academy. Tim Gipple, Evan Hansen, & Tim Mellina are currently attending Firefighter 2 class at the Cape May County fire Academy. Dave Lepor, Tim Mellina and Denny Robertson, Jr. are currently attending Fire Officer 1 classes. Johnny Matteo, Jeremy Patterson and Josh Vandermark are currently attending Firefighter Tactics through Camden County College. Bill Szemcsak, throughout March and April, attended Instructor 1 course at Atlantic County Fire Academy. Bill also attended the NJEPA Conference held in Atlantic City, attended Incident Response to Terrorist Bombings and Operations through New Mexico Tech, and recently completed 36 hours NJTF1 annual drill. **** ANNOUNCEMENT **** JUNE 3rd, We will be having an Open House / Membership Drive. 11am - 2pm. Come out meet the members, see the equipment, see demonstrations, We hope to see you! July, 2016 - Recently some members were recognized for their years of service to Erma fire company and the community they serve. Vince Matteo, 10 years of service. Eric Nelson, 10 years of service. Floyd "Flash" Hughes, Life Membership. Warner Muller was recognized for his service as Chief for the past 13 years. Bill "Radio" Sczemcheck was recognized for his service as outgoing Captain. William Jennings was recognized for his many years of valuable service to the company while holding the position of Chief's Aide. Dennis Robertson, Jr. was promoted to Lieutenant. Tim Gipple and Tim Mellina are currently in Firefighter 1. Eric Hanson, John Matteo, Jeremy Patterson, Dennis Robertson, Jr. and Mike Taylor completed Firefighter 2. John Matteo and Jeremy Patterson completed EMT class. Eric Hanson, Dennis Robertson, Jr. and Mike Taylor completed Riding The Right Front Seat, Advanced Ladder Operations and the ICS 200 class. February 2015 - Erma Fire members have completed out annual Recertifications on subjects covering: Bloodborne Pathogens, Right To Know, MSDS, Air Monitoring Respiratory Protection, Lock Out Tag Out, and other subjects, as well as our annual physicals. Members Jeremy Patterson and Frank Jenkins have started Firefighter 1 at Atlantic County Anthony "Tony" Canale Training Center. We wish them the best of luck. Feb., 2014 - Erma Fire members have recently completed their yearly recerts on subjects covering Bloodborne pathogens, Right to know / MSDS, Air monitoring, Respitory Protection, Lock out Tag out, and other subjects as well as our annual phycicals. John Michael Rogers III - 9 lbs 01oz, 21" long - born December 12th, 2013. CONGRATULATIONS John & Amanda! We also like to welcome Hailey Grace Laag - 7lbs 1oz, 20.5" long - born January 11th 2014. CONGRATULATIONS to Jeff & Keri-Lyn and BIG Brother Mack!! During our Installation dinner in January, Ryan Sheets was reconized for 5 years of service to Erma Fire Company. Floyd "Flash" Hughes, Karl Hughes, Kurt Hughes, Eileen Jennings, & Warner Muller were recognized for 20 years of service to Erma Fire Company. Thank you all for your continued & dedicated service. October 1st & 2nd: Firefighters Markie Alexander, John McCabe, Dennis Robertson Jr., John Rogers Jr. & Chief Warner Muller attended L.D.H. /Pump class. Presented by Chief Bill Dukes. Hosted by Villas Fire Company. Ladder 6253 took 2nd. place for best appearing ladder in the New Jersey state Fireman's Convention. Special thanks to John Rogers & Dennis Robertson Jr. for the hard work put into it. Firefighters John McCabe, John Rodgers, and Chief Warner Muller attended the Seminar "First in, Make it or break it" Presented by, Capt. Michael Hope, Eng. 16 Philadelphia Fire Dept. Hosted by, Wildwood F.M.B.A. 50. Firefighters Dale Gentek, Art Hayden, Jeff Laag, and John McCabe Attended the F.O.O.L.S. "One Ambition" Tour Seminars. "Where have all the Firemen gone?" Presented by Capt. Mike Dugan F.D.N.Y. Ladder-123. "You're in Command....But are you in control?" Presented by Firefighter Art Bloomer, Kearny Fire Dept. Tower 2 . Firefighters Arthur Hayden, Jeff Laag, and Don Montgomery Attended "Fireground Tatics" class. Hosted by Hamilton Career Firefighters Foundation. Presented by John Norman. Our extended family has grown by one! Tino Leao & Kaycie O'Brien are the proud parents of Baby Boy Rhemi, born January 26, 2013. CONGRATULATIONS AND BEST WISHES!! Firefighters Markie Alexander, John Matteo, Jr. & Dennis Robertson, Jr. have completed and passed all classes & tests to graduate the Firefighter 1 course at the Cape May County fire Training Academy. CONGRATULATIONS for a job WELL DONE!! All Erma Firefighters have completed their yearly Recerts and physicals. We would like to announce our 2013-2015 Executive Board. On December 17, 2012, Erma Fire held their Family Christmas get together at the Firehouse. The Following Members were recognized for their years of service to Erma Fire Company and the Communities we serve. Was awarded to Patrick Devlin for 15 years of Maintaining membership percentage and Dedicated service to Erma Volunteer Fire Co. THANK YOU PAT!!! Members Donna Alexander, Markie Alexander, Eric Hanson, John Matteo and Dennis Robertson Jr. are currently attending the Firefighter 1 course held at the Cape May County Public Safety training Academy. Erma Fire members Dale Gentek, Art Hayden, Jeff Laag, John Matteo, John McCabe, Don Montgomery, Alex Toler and Bill Szemcsak also attended Responding to Carbon Monoxide Emergencies and Increasing Operational Effectiveness seminars held during the NJ State Firefighters Convention. Hosted by Wildwood FMBA Local 50. March 6, 2012 - Five full time firefighters, including two Erma Fire members - Bill Szemcsak and Alex Toler, were sworn in at a Cape May City Council meeting March 6. 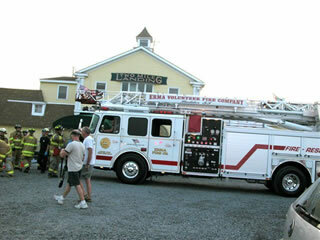 Feb. 19, 2012 - Members of Erma fire completed their mandatory recertification's and physicals. Physicals included, but were not limited to: EKG, PFT, Hearing, Vision, and overall physical condition. Recerts covered the following: Ropes & knots, S.C.B.A. competency course, Air & gas monitoring, S.C.B.A. maintenance & care, infectious control, air and bloodborne pathogens, and S.C.B.A. fit test. COURT HOUSE � Voters in the county's four townships should mark their calendars for fire district elections Sat., Feb. 18 from 2-9 p.m. at their local firehouse. Those who opt to vote by mail may have already cast their ballot and returned it to the Cape May County Board of Elections. Each fire district's commissioners, some of who will be standing for election, hold these quiet elections. Those commissioners are the ones who raise needed funds for volunteer fire companies to operate. Budgets that will go before voters on Feb. 18 will make it possible for firefighters to be attired in the proper safety gear and ensure the vehicles needed to fight fires are up to date. Those budgets may be viewed on tax bills listed separately under �Fire District� tax. District No. 1, Villas, polling place Villas Firehouse. Vote for two commissioners, full three years: Carrise L. Mornick, Peter C. Smith. Budget: $605,639 with $490,639 to be raised by taxation. District No. 2, Town Bank, polling place Town Bank Firehouse. Vote for two commissioners, full three years: Lewis H. Conley Jr., Robert A. Nolan. Budget: $1,046,794 with $871,794 to be raised by taxation. District No. 3, Erma, polling place Erma Firehouse. Vote for two commissioners, full three years: Gary Douglass, Dennis Robertson. Budget: $827,483 with $697,464 to be raised by taxation. January 30, 2012 - Erma firefighters Jeff Laag, John McCabe, John Rogers, Tony Simon, and Mike Taylor attended a Smoke Recognition class hosted by the Avalon Vol. Fire Dept. The course was presented by instructors from @Safety and Survival Training, LLC. January 23, 2012 - Erma firefighters George Karolyi, John McCabe, John Rogers and Tony Simon attended a R.I.C. Awareness seminar hosted by the Avalon Vol. Fire Dept. It was presented by instructors from @Safety and Survival Training, LLC. 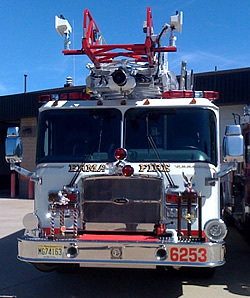 We at Erma Fire wish everyone a Happy, healthy & prosperous New Year for 2012! We ended 2011 with answering to 232 calls for service, not including assorted schools, training, lectures, and drills. Mark Alexander - For outgoing President, 15 years of service as well as achieving Life Membership to Erma Fire Company. Allyn Devlin - 25 years of service to Erma Fire Company. Ryan Dougherty - 5 years of service to Erma Fire Company. 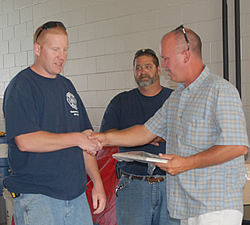 Chris Karolyi - 5 years of service to Erma Fire Company. Jeff Laag - 15 Years of service and achieving Life Membership to Erma Fire Company. 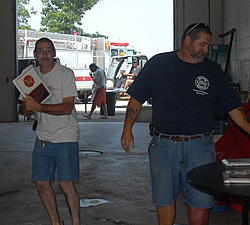 Dave Lepor - 25 years of service to Erma Fire Company. Dan Rogers - 5 years of service to Erma Fire Company. 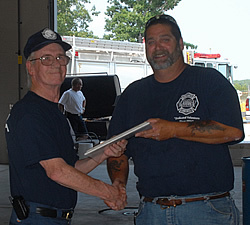 Alex Toler - 5 years of service to Erma Fire Company. Ryan Toler - 5 years of service to Erma Fire Company. 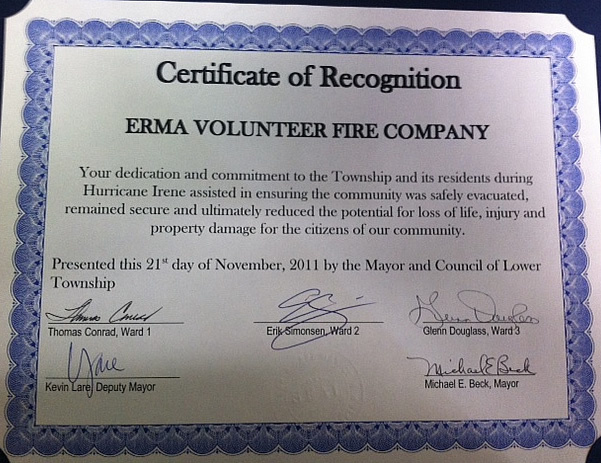 November 21, 2011 - Leading up to and during Hurricane Irene, members of Erma Fire Company manned our station and helped evacuate residents to other counties, responded to 9 calls for service, and helped care for the pets that were left behind in the makeshift shelter in the hanger of the county's airport. As well as housed the outer islands fire apparatus in our station. 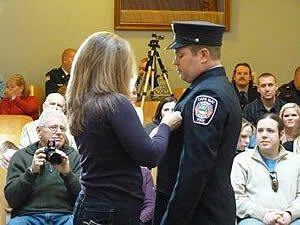 November 7, 2011 - Erma Fire Company accepted Donna Alexander as a member. Lt. Bill Szemcsak completed the I400 training class. Black Friday, Nov. 25th, Erma Fire escorted Santa Claus around the fire district giving out candy canes and collecting children's Christmas list as well as 1 "Binky" from a little girl who is now a BIG GIRL!! Santa was helped by Firefighters Evan Hanson, Chris Karolyi, Asst.Chief Jeff Laag, Ryan Toler, and apprentice Matt Lepor. October 26, 2011, Firefighters Chris Karolyi and John McCabe visited with Girl Scout Troop 43006, covering topics of fire safety, the different services the fire department provides, when not to dial 911, and a demonstration of a firefighter putting on full turnout gear and air pack as so not to be afraid if they were to see a fireman dressed like that looking for them. October 26, 2011 - Art Hayden, Chris Karolyi, George Karolyi, Jeff Laag, John McCabe, Warner Muller, John Rodgers, Bill Szemcsak, and Mike Taylor attended Arson Awareness for the First Responder, presented by, Sgt. John Lightbody, CFEI (Ret'd) Ocean County Prosecutors Arson Task Force. Held at the County Fire Training Academy. October 16, 2011 - Chris Karolyi and Bill Szemcsak attended Drill Ground Instructor class held at the Atlantic County Fire Training Academy. September 15, 2011, Jeff Laag and Bill Szemcsak attended The Art of Space Making in todays modern vehicles "Extrication class" held in Wildwood, NJ during the state convention. September 15, 2011, Members Dale Gentek, Art Hayden, Chris Karolyi, George Karolyi, Kendul Kennedy, Tino Leao, John McCabe, Don Montgomery, Mike Raspa, and Ryan Toler attended the NJ F.O.O.L.S. "One Ambition Tour" Training Seminars held during the New Jersey State Firemen's Convention in Wildwood. Instructed by Lt. Steve Gillespie, F.D.N.Y. Division 7 (Bronx) "Residential Fire Operations" and Commissioner Mike Lombardo, Buffalo F.D. "Leadership on the Fire-ground"
September 13, 2011, Members Art Hayden, Chris Karolyi, George Karolyi, Jeff Laag, John McCabe, and Alex Toler attended Aggressive Residential Search lecture hosted by F.M.B.A. 50 held at the Wildwood Convention Center. Instructed by Chris Collier, F.D.N.Y., of Brotherhood Instructors L.L.C. Life Membership is obtained by completing 15 years of service to the Fire Company while keeping above 60% attendance of all fire calls, drills, meetings, and special assignments. 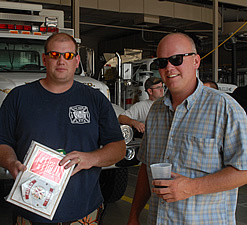 August 3, 2011 - Firefighters Mike Raspa and Mike Tayler, having successfully completed all classroom, exams, and hands-on evolutions, have completed the Firefighter 1 course at the Training Academy. Erma Fire hosted a lecture on Building Collapse / Trench rescue at Erma firehouse July 31st presented by, Mike Donahue, owner and founder of Progressive Rescue. The lecture was attended by representatives from fire companies throughout N.J. & P.A. Those in attendance from Erma Fire were Art Haydon, George Karolyi, Chris Karolyi, John McCabe, Tony Simon, John Rogers and Bill Szemcsak. John McCabe and John Rogers attended Fuel Tanker Safety lecture presented by Sunoco hosted by Rio Grande Fire. Solar Panel fires & emergencies lecture. Presented by New Jersey state electrical code inspector, hosted by Townbank Fire. 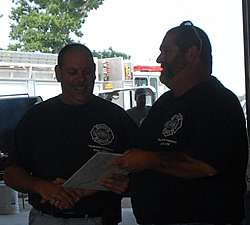 July 12th, 2011 - Erma fire company Accepted Tino Leao as a member. F.F. Ryan Dougherty has successfully completed all classes and hands on training requirements to complete Firefighter 1. With thanks to the hard work of Center Line Services LLC. and a few of our members, the walkway is very near completion. Just have to do some cosmetic work such as flowers and plants, and she'll be done. If interested in being a part of it, please click the buy a brick tab. We completed the old block sign, stone, and weed removal and installed the new pavers along with engraved pavers. We still have plenty of room and plenty of bricks left to promote your business, honor a loved one, or to just leave a message for others to see for many years to come. THANK YOU FOR YOUR CONTINUED SUPPORT!! Firefighters Ryan Dougherty, Evan Hanson, Brian Matthews, and Ryan Sheets attended Open Water Awareness class held at the Coast Guard base. Firefighter Chris Karolyi, Safety Officer Kendul Kennedy, Chief Warner Muller, Captain John Rogers, and Lieutenant Alex Toler, completed the I.C.S. 300 course held March 4th, 5th, & 6th. and completed Firefighter 1 Academy held at the Cape May County Fire training grounds. 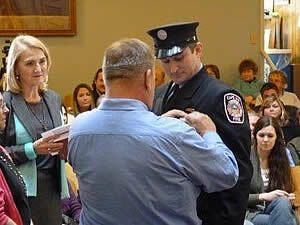 March 7th, - Erma Fire welcomed new members Sara Kirk, Mike Raspa and Junior F.F. George Caverly. attended "Managing the Mayday" class held at Villas firehouse. March 14th - Erma Fire held a High Rise drill at our firehouse. In full gear and S.C.B.A., we split into two teams, 1st team put in place their High Rise pack, and advanced their charged handlines up the stairwell to the second floor and proceeded down the hallway. 2nd team proceeded to carry in their high rise packs, connect to the standpipe and deploy and advance their charged through the engine bay and out the back door. Then each team switched teams to cover both excercises. FACT: 73% of United States Firefighters are Volunteers! March 21st - Monthly Apparatus and equipment inspections. March 28th - Water flow psi and gpm testing on various nozzels. On Febuary 6th, Erma Fire accepted Brian Matthews and Mike Tayler as members of Erma Fire Company. Sunday, Febuary 13th - Erma firefighters gathered at the firehouse to complete the mandatory yearly recerts. 1) Air pack fit testing. 3) Emergency escaping & handling teqniues of your S.C.B.A. 4) Radio operations, Handling, proper use, switching channels / problem solving during no visability while wearing gloves. and mayday calls. 5) Power point presentaion on company S.O.P.'s/S.O.G. 's, Firefighter safety, and Personel accountability. and topics covering Haz-Mat, and Gas meters. On the 14th of Febuary, members were mustered for our annual physicals, which included EKG's, PFT's, hearing, vision, and standard physical and vitals. Wwe also performed the monthly apparatus checks & inspections. Febuary 21st, we held a Residential Search & Large Area Search drill. Asst. Chief Jeff Laag, Lt. Bill Szemcsak and Lt. Curtis Warburton attended the National Fire Academy class Preparation for Inital Company Operations (P.I.C.O. ), held at the Atlantic County Fire Academy. February 28th, Erma Fire held a class on Terrorism Awareness Instructed by Barry Eck, Municipal Coordinator, Borough of Sayreville, NJ. Office of Homeland Security and Emergency Management. Some of the topics covered, Mass Evacuation, Decantamination, pre-planning, table top scenarios, and review the I.C.S. structure. Jauary 11th, 2011 - Monthly preventive maintenance on all apparatus, equipment, and tools this ensures that everything at the time is in good working order and ready to go or to be taken out of service to be repaired or replaced as soon as possible. January 16th - Members of Erma fire participated in a rope awareness class presented by Mike Donahue, owner and founder of Progressive Rescue. Members learned by classroom and hands on, Types of knots, basic rope skills, and mechanical advantage systems. Firefighters who took part in the class were Dale Gentek, Evan Hansen, Asst. Chief Art Hayden, Chris Karolyi, George Karolyi, John McCabe, Lt. Alex Toler, Ryan Toler, and Bruce Townsend. January 17th - Work detail. After many years of service, Eng.6232 is now out of service. Members gathered around 32 and removed all equipment, hose, tools and radios in preparation of retiring the Buddha Express. January 19th - Erma Firefighters participated in a large ground search involving numerous police and fire agencies. January 24th - Members of Erma fire attended a class on Elevator rescue & Emergencies Hosted by Avalon Fire Company station 11 and The Golden inn Avalon, NJ. Instructed By Dep. Chief Daniel Speigel, Wildwood Fire Dept & Firefighter Mark Becica, Baltimore City Fire Dept. by both classroom and hands on, firefighters learned history of elevators, types, hoistways, forcing techniques, types of keys, inner workings of elevators, elevator rescue techniques and methods. Erma Firefighters attending Asst. Chief Art Hayden, George Karolyi, John McCabe, and Capt. John Rogers. January 24th - Drill consisting of a Firefighter profienciancy course. The course consisted of 150ft hose lay, Kisor sled, dummy carry, ladder placement/climb, air pack assembly (while wearing gloves) and full turnout gear. January 31st - Forcible entry tool drill. An overview of Forcible entry hand and power tools, on their uses, applications, and proper handling. Congratulations to Firefighter George Karolyi for successfully completing all classes and passing the final exam in the 154-hour Firefighting 1 course held at the Cape May County Police/Fire Training Academy. On July 17th, Erma Firefighters participated in Water Rescue Awareness Class hosted by U.S.C.G. TRACEN in Cape May. Capt. Stanton Ocean City Fire Dept., & Capt. 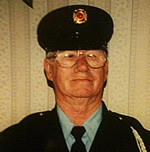 Dominic McClain North Wildwood Fire Dept. Erma Firefighters learned basic swimming techniques, water safety, rescue techniques, as well as self rescue methods, & learned to identify hazardous water conditions. Attending Erma Fire Company members included Chief Warner Muller, Asst. Chief Arthur Hayden, Lt. John Rogers, Lt. Alex Toler, Safety Officer Eileen Jennings, Firefighters Bill Jennings, George Karolyi, John McCabe, Seth Schoenfeld, Ryan Toler, & Bruce Townsend. On Thurs. June 10, 2010 at approximately 9:10am the Lower Township Police Department Received a report of a possible fire in a trash truck at the Lower Township DPW, located on Seashore Road in the Townships Erma section. Investigation on scene determined that DPW workers observed white smoke coming from the back of a trash truck. Believing the contents of the truck may be on fire some of the trash from inside of the truck was dumped in the parking lot in order to extinguish the fire. At that time several DPW workers reported feeling light headed as a result of breathing in the fumes that were coming from the truck. Lower Township Police, Fire and Rescue units responded to the area and requested the assistance of the County Office of Emergency Management and the Counties Hazardous Material CBRN Unit. Officials determined that discarded paint may have mixed with another chemical agent inside of the truck causing a chemical reaction releasing fumes. Four DPW workers were evaluated on scene by the Lower Township Rescue, but did not require transportation to the hospital. The Erma Fire Department stood by while the chemical was neutralized. On May 27, 2010 at approximately 10:20 p.m., the Lower Township Police Communications Center received a call from the Wildwood Crest Police Department advising that Wildwood Crest had received a call reporting a boat fire at the Lighthouse Pointe Marina located in the Shawcrest Section of Lower Township in the area of the George Redding Bridge. 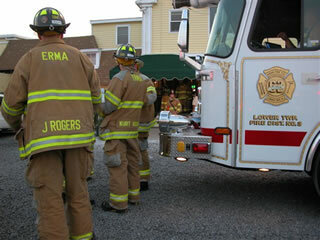 Lower Township Police, Fire and Rescue Units responded to the call. Upon arrival, the Erma Fire Chief reported a working boat fire in the water at the Marina's �D� Dock. The firefighters, who fought the boat fire during the height of a thunderstorm that was hitting the area at the time, were able to lay several hose lines down the dock to the area of the boat. Erma Firefighters were able to untie another boat in the area that was endanger of also catching fire and pull it to a safe location. The New Jersey State Police Marine Law Enforcement Bureau and a Firefighting Boat from the Cape May Coast Guards Small Boat Station, were also called to the scene. Firefighters were able to knock the fire down in approximately 20 minutes. The vessel is described as a 30 foot, 1976 Chris Craft, named the Q-Tee. It was later towed by Tow US Salvage, to the Shawcrest Marina. The cause of the fire is currently under investigation by the New Jersey State Police Marine Law Enforcement Bureau and the Cape May County Fire Marshall's Office. In May, 2010, Firefighter Bill Szemcsak attended a Comm. L (communication leader) class held in Atlantic city. Put on by NJEPA. Also, in May. Firefighters, Jeff Laag , Bill Szemcsak, and Curtis Warburton attended Confined space 1 and 2 training held at the Atlantic county fire academy. In June, Firefighters Jeff Laag, John Rogers, Bill Szemcsak, Alex Toler, and Curtis Warburton attended Thermal imaging class at the Atlantic county fire academy. On April 17th, 2010, Lower Township fire departments conducted a drill today simulating a mid air collision between two single engine general aviation aircraft. Erma, Villas and Townbank fire departments participated in the drill with the NJ state Forest Fire Service, Atlanticare and the Cape May County office of Emergency Managment. The drills objectives were to create a unified command post which helps with the organization of resources and the preparation for the evacuation of passengers. In a joint press release by all three fire departments the following statement was issued: "As an all volunteer township the fire chiefs want to make sure the public is aware of how serious they take their preparation to potential local emergencies". The fire companies would like to thank the Lower Township MUA for allowing the use of their property for the drill. Erma Fire placed Ladder 6253 in Judging at the 132nd Annual Firemen's Convention and parade held in Wildwood September 18th & 19th, 2009. 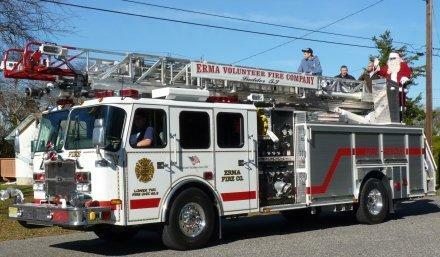 Erma Fire won "Best Appearing Apparatus" in Cape May County as well as "Best Appearing Quint" In New Jersey !!! 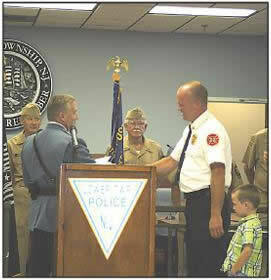 Lt. Alex Toler completed the Atlantic County E.M.S. Instruction course. Asst. Chief Art Haydon, Lt. Curtis Warburton, & FF Bill Szemcsak completed Technical Rescue 2 Training in Lakehurst, NJ. Lt. Alex Toler & FF Bill Szemcsak completed Specialized Firefighting training in first due company operations presented by Fire ground Technologies. On October 25th, 2008, Ryan Dougherty, Chris Karolyi, John McCabe, Eric Nelson, John Rodgers & Alex Toler joined in with other County fire companies to help Cape May Point station 58 to celebrate and house their new KME 2000 GPM Engine. Erma Fire brought back 1st place trophies for best Engine and Best Ladder truck. 9 Sept. 08 - Capt.Jeff Lagg, Asst. Chief Art Hayden, FF Chris Karolyi, FF Bill Szemcsak, Lt. John Rogers and FF Brian Ladzenski attended a one-day seminar on "Strategy and Tactical Considerations of Hotel / Motel Fires". DIAMOND BEACH � Erma Fire Chief Warner Muller, on Monday, told the Herald that diners in the Crab House Restaurant reported the collapsing floor made a sound like a series of gunshots. He said an initial call reported a collapsing floor and gunshots. No one fell all the way through to sand below the restaurant. During high tide, there is water beneath the restaurant. Muller said no serious injuries were reported. He said nine persons were treated at the scene. Nine other persons transported to Cape Regional Medical Center, Court House, where they were treated and released. They were: Carol Werwinski, 42, of Philadelphia; Betty Dewitt, 50, of Trumbaursville, Pa.; Helen Murphy, 64, Philadelphia; Chitlyn Kucher, 18, Quakertown, Pa.; John Kemp 45, of Philadelphia; an 11-year-old juvenile from Philadelphia; Edward Giamantonio, 61, West Chester, Pa.; Jackie Butkiewicz, 43, Monroe; and Cindy Dougherty, 48, of Edison. The collapse stopped short of the kitchen. It trapped a server in a walk-in refrigerator after he went looking for a side order of horseradish for a table. �It was prime time, the place was loaded,� said Muller. He said the firefighters' first job was to evacuate everyone from both buildings. He said he called State Police Task Force One Urban Search and Rescue Unit and Atlantic City Fire Departments Collapse Unit. �If there was entrapment, Atlantic City Fire (Department) could have come down, shored the building up until we could get in there and do the rescue,� he said. He said all in all, rescue efforts worked very well. 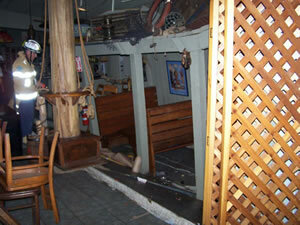 Muller said the Crab House was holding its own weight via the walls. �It's just kind of hanging there, pulling itself down,� he said. A question in Muller's mind; if the Crab House collapses, will Two Mile Landing also collapse? He said the restaurants appear to have had addition after addition constructed over the years. A second-floor apartment connected to the Crab House has been vacated. Muller said air conditioning units may need to be removed from an area of sagging roof between the two restaurants. He questioned whether it was safe to put a man up there to cut the units loose. Muller said the floor is sloping in the entrance foyer. He said when he arrived, people were pouring out of the restaurants. He said some diners ran towards the parking lot, some in the opposite direction onto a deck. He said the fire company had reports of trapped people and missing persons, which were proven untrue. Kitchen and restaurant staff members immediately pulled out people who fell into the void. �They actually did the rescues before we got here,� said Muller. On Monday, kitchen employees were washing garbage cans outside the Two Mile Landing Restaurant. Crab House Manager Mark Earhart said fish and crabs were being disposed of since water, electric and gas was turned off in the restaurant. He said he was creating an inventory of all lost items. Earhart said some diners were reluctant to leave because they hadn't finished eating. Many ate free that night, leaving before their meal checks arrived. 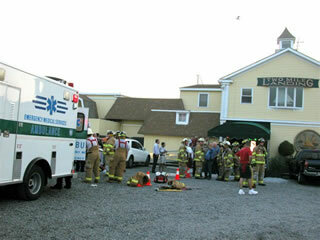 Fire companies responded from Erma, Wildwood, Wildwood Crest, Cape May and Town Bank. Ambulances responded from Middle Township, Stone Harbor, all the Wildwoods, and Cape May, said Muller. �Everybody cooperated, the assistance was 100 percent,� said Muller. He said he was grateful for all the mutual effort that was provided. Chief Ed Donohue presents a certificate to Erma Fire Chief Warner Muller for his role as the incident commander during the Crabhouse restaurant building collapse July 7. Nine people were injured in the incident, which took place when hundreds were in the restaurant. DIAMOND BEACH -- Nine persons were injured July 7 at about 7:30 p.m. when the floor of the Crab House Restaurant, which adjoined Two Mile Landing Restaurant, collapsed in a V-shape, according to Conrad Johnson, Wildwood fire chief, who acted as public information spokesman at the scene. Johnson described the incident as a �partial collapse of the interior floor or the bar, kitchen and service area.� He added that about 300 patrons were in the immediate area of the collapse, and about 1,000 in the restaurants, which are located off Ocean Drive, between Wildwood Crest and Cape May. The portion of the restaurant that collapsed was not over water, he said. None had to be rescued from the incident. Johnson said none of those hurt appeared to have sustained life-threatening injuries. All were transported to Cape Regional Medical Center, Court House for treatment. Inspectors and rescue teams from the New Jersey State Police Task Force 1 and from Atlantic City Fire Department were summoned to the scene, Johnson said. All employees and persons in the restaurant at the time of the incident were accounted for, he said.